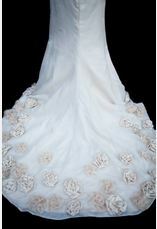 What’s Your Custom Wedding Dress Style? This isn’t any dress, in any store window or magazine. It’s your dress. What does that dress look like?…Perhaps it won’t be typical. Maybe you want to stand out–add a little sass. But, is this even possible (you may think)? Can you create a wedding dress that only exists in the bubbly meanderings of your whimsical, wedding mind? With ‘sparkle&pomp,’ you most definitely can! Owner and designer, Samantha Janetos extraordinaire, will be your fanciful guide on the path to your wedding dress dreams! Samantha extraordinaire will take the dress you’ve already purchased, or have created in your mind, and bring it to life! I am currently on this wedding dress journey and, throughout, I have been excited and thrilled around every creative corner. I am in love with my dress so far–with its happy colour, couture and flair! I highly recommend this custom-dress path to any bride with a desire to create, to not break the budget, to have some fun, and to enter into a dazzling partnership with a skillful designer creating your dream wedding dress. This journey has certainly supercharged my wedding dress evolution well-beyond my expectations! I can’t wait to see my end-result, and I look forward to sharing my final dress creation (with pictures) very soon! Stay tuned, sassy ladies! This entry was posted in custom made, dresses, revamped dresses, The Brides' Project, wedding dresses and tagged chic, custom made, designer wedding dress, one of a kind, revamped dresses, revamped wedding dresses, The Brides' Project, wedding dress, wedding gowns. ← Revamped Dresses: Cocktail Style!